of Team New Brunswick at the Canada Summer Games. In 1981 he competed in the 5km and 10km events. In 1985 he raced the 1500m where he placed 6th, and was co-captain of the New Brunswick Track team. Dr. Hooper began his chiropractic sports injury practice in 1989. He has been at the 2003 World Duathlon Championships in Switzerland as both an age group duathlete and as the Canadian team sports chiropractor. In 2004 he attended the World Triathlon Championships in Portugal again as an age group triathlete and as the Canadian team sports chiropractor. In 2010, he was one of 22 sports chiropractors selected to the core medical team for the Vancouver Olympics. 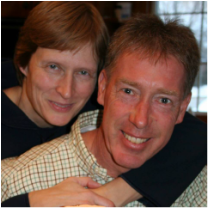 Kevin has been coaching several triathletes and runners for many years. He still competes as a masters runner provincially on the track, road races and cross country. He received his "level 2" Club Coach certification in January 2018. His evaluator stated, "Your coaching style is inclusive, positive and clearly effective with your student-athletes!" Shelley is trained as a registered nurse spending 10 years working in Torontoʼs busiest hospital in emergency, critical care and coronary care. Shelley works amazingly with the younger runners on the team. She finds unique ways to keep the kids motivated and getting the best out of them. In addition to being a competitive high school runner, basketball player and downhill skier, she has competed in sprint distance triathlons. She is still competitive playing womenʼs hockey and is an avid cyclist as well as cross country skier. Shelley is a wonderful asset to the coaching staff. We have several additional volunteers on our coaching staff to help our athletes in our various groups. Their help and expertise is critical to the success of our team. *set ON indoor Record - Tyke Girls 9y.o. *set Ontario Record - Tyke Girls - 10y.o.